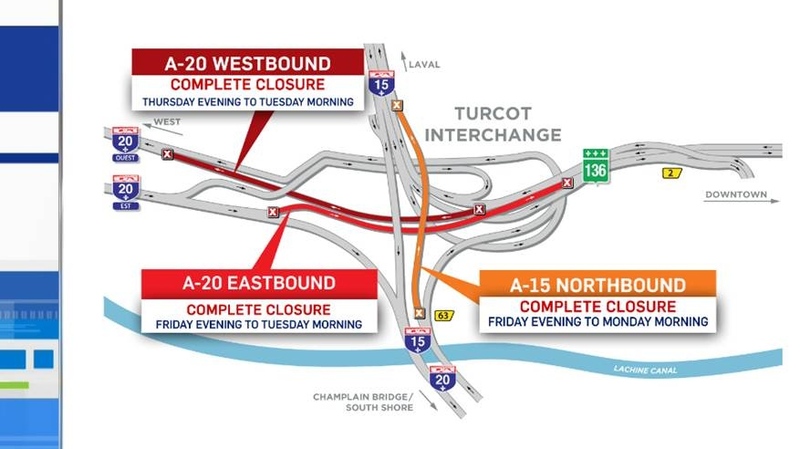 Work to take down a portion of the Highway 15 ramp in the Turcot Interchange begins Thursday night, ushering in one of the toughest weekends for Montreal drivers in some time. And we’re far from the end of the road when it comes to infrastructure projects, said Transport Minister Francois Bonnardel. Transport Quebec is calling the upcoming road closures in Montreal ‘unprecedented,’ part of a complex operation to dismantle a section of Highway 15 that’s more than 25 metres above the ground. There are no shortcuts; the work must be done, said Chantal Rouleau, the minister responsible for Montreal. “Yes, it's challenging, and it will be challenging for the next years, of course, because we know that we have a lot of work to do,” she said. “What I want to do is work very closely with Montreal’s mobility squad and to find mitigation measures,” said Rouleau. Drivers are being encouraged to use public transit – but Transport Quebec is also asking people to consider working from home, avoiding non-essential trips or changing their schedules. While the Turcot project is expected to be complete by 2020, the traffic woes may not end there. An internal city document suggests there are still decades of road work ahead. According to the 2016 report obtained by the Montreal Gazette, even if the city tripled its investment in significant infrastructure repairs right away, it wouldn't catch up on what needs to be done until around 2040. “It's a lack of investment for the past 50 years in Montreal that brings this situation,” he said. “After we finish the Turcot Interchange, we'll start Louis-Hippolyte-La-Fontaine (Tunnel), so for sure in the next ten years it's going to be a lot of investment in Montreal, but we have to do it,” said Bonnardel, who added that the CAQ government is studying future public transit projects that could make a difference in the long term. “The yellow line for the metro, the blue line, Pie-IX, Notre-Dame,” he said.